Keep coming back to this link as I gather more infos and pictures to post to this page. In the meantime, visit the SW Collecting page to get the latest insight into Star Wars collectibles, toys and memorabilia. 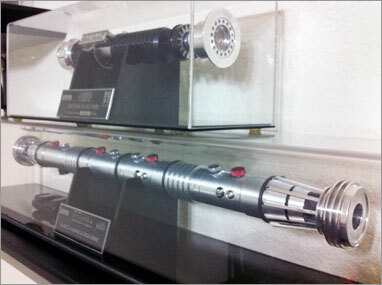 These are the Larbel (Pre-Master Replicas), numbered limited edition, surgical-grade stainless steel version replicas of the Qui-Gonn Jinn and Obi-Wan Kenobi Lightsabers as seen in The Phantom Menace. This is a replica of the Qui-Gonn Jinn Comm Link based from the Star Wars Visual Dictionary. It is replicated out of the same "found" items such as the gillette razor and solder lugs used by the original prop makers. The Obi-Wan Kenobi Comm Link replica based from the Star Wars Visual Dictionary. 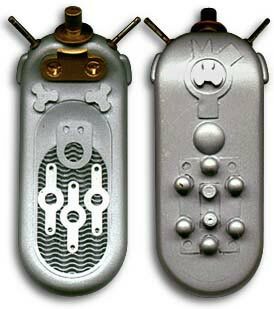 This prop is resin casted out of the same "found" items such as the gillette razor and seastrom solder lugs used by the original prop makers. It is then painted to match the photo on the VD. 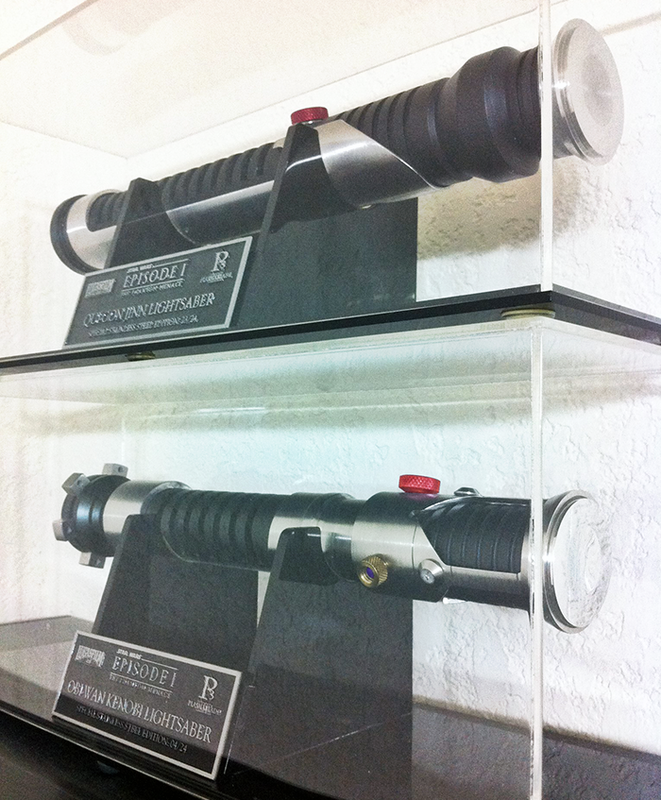 My Obi-Wan Kenobi (TPM) replica lightsabers. The sabers are crafted from machined aluminum and stainless steel, delrin grips, anodized aluminum knurled buttons and a polished stainless steel core shaft. 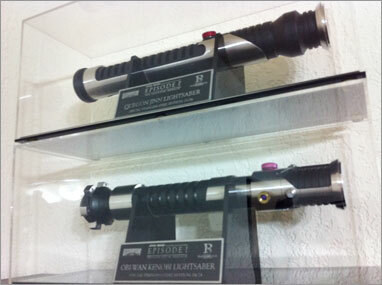 This is the Lucas licensed replica of the saber used by old Ben Kenobi in the Star Wars "A New Hope" made by Icons Replicas. 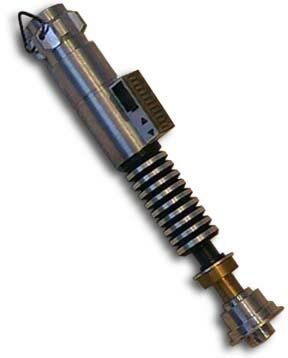 This saber is made from die-stamped metal parts and casted plastic and rubber parts. The original saber was complex, made from found items of that time such as a sink drain, lawn mower gear, motorcycle grips, calculator bubble and a shower knob (hand wheel) to name a few. 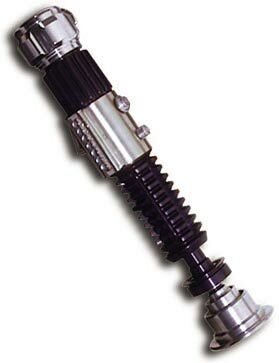 This is the Luke lightsaber replica from Return of The Jedi. 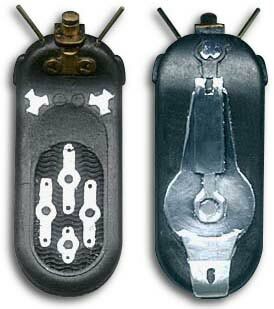 Its made of solid machined aluminum with the black and copper colored parts anodized. 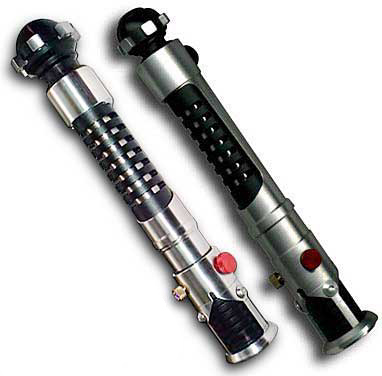 This saber initially was lacking several details such as the d-ring, the green-red arrow indicators on the switch box and also the black buttons. I also took the paint out and anodized the saber for durability. My final project for this saber is to drill the 2 mini screws on the switch box.